This video was shot by a company called Team BlackSheep. They sell high-end drones for hobbyists (but much, much lower end than military versions). These are small four-propeller remote-controlled helicopters with cameras called Quadrocopters, costing about $1,600. To promote their business they shoot videos with spectacular views of the world’s great cities or famous landmarks from the unusual close-up perspective of the drones. Their latest sends a drone over and around (but not into) the wreck of Costa Concordia. It also meanders around some of the equipment readying the wreck for salvage. The video is definitely worth a look because it yields some spectacular sunset views of the ship and Giglio Island. If you have a drone, and are planning to go to Italy, don’t plan to duplicate the flight. It apparently got Team BlackSheep in trouble with the Italian police, because Costa Concordia is off limits to everyone except the salvage crew. The US Coast Guard medevaced a 50-year-old man from Carnival Splendor Saturday evening (May 18, 2013) when the ship was about 150 miles east of Cape Lookout, NC. The Coast Guard launched an MH-60 Jayhawk helicopter and an HC-130 Hercules aircraft from the Coast Guard station at Elizabeth City, NC. The helicopter can be seen in the photo below hovering next to Carnival Splendor. The ship contacted the Coast Guard Saturday evening about 8pm reporting the man had a heart attack and requested assistance in getting him to a shoreside medical facility. The Coast Guard airlifted him from the ship and took him to a Norfolk hospital. He was reported to be in stable condition. 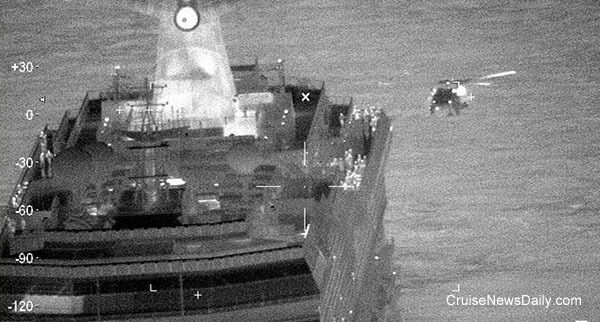 In the infrared video below you can see the Coast Guard rescue swimmer first being lowered to the deck. The first to be hoisted to the helicopter is a nurse from the cruise ship, followed by the patient and finally the rescue swimmer returns to the helicopter. But there's one more part to the story. It was the rescue swimmer's first mission. The Coast Guard tells us his interesting story below the video. On a stormy spring night at Coast Guard Air Station Elizabeth City, N.C., Coast Guardsmen stood watch, ready to respond at a moment’s notice. Following a busy afternoon of searching for two missing boaters, the evening was accompanied by nothing more than the occasional crackle of a VHF-FM radio, followed by prolonged silence. Around 8 p.m. a call came in from a medical representative from the 952-foot cruise ship Carnival Splendor. A 50-year-old man suffered a heart attack and needed to get to a hospital. The ship was 150 miles east of Cape Lookout, N.C., in the Atlantic Ocean and the Coast Guard was the most qualified to respond. As the search and rescue alarm sounded, it was operations normal for most, another chance to save a life. However, for one junior petty officer, this medevac case was far from normal. He left out on his first rescue case since earning his spot as the 830th Coast Guard rescue swimmer and the journey he's taken to get to this moment has been a challenging one. Fresh out of rescue swimmer school and EMT school, Petty Officer 3rd Class Steve Scheren spent the last year training for this day and accomplished what he set out to do three years ago. Scheren completed his 12-week airman program at Air Station Elizabeth City, where rescue swimmers challenged him mentally and physically on a daily basis to ensure he was prepared for his upcoming advanced training program. After completing the prerequisite airman program, he began his 16-week rescue swimmer school in Elizabeth City, where he beat attrition rates averaging 50 percent and peaking at 80 percent. Scheren spent countless hours in the pool building his strength and endurance, and in the classroom he built his foundational knowledge on medical response. Tonight, as Scheren grabs his gear and runs toward the MH-60 Jayhawk helicopter, he’s confident he can save this 50-year-old man’s life. Crews aboard an MH-60 Jayhawk helicopter and an HC-130 Hercules aircraft took off from the air station and headed out over the Atlantic Ocean as the sun began to fade over the horizon. At approximately 9:30 p.m., the Hercules crew hailed the personnel of the cruise ship and began to discuss their plans for medevacing the man. Meanwhile, the Jayhawk was en route, traveling nearly 180 mph. Scheren was aboard and had plenty to keep him busy while flying across open ocean toward the ship. Running scenarios through his head, Scheren was making sure he had the equipment he needed and was thinking about what he had to do. Having spoken to other swimmers in school and in his shop, Scheren heard stories of others’ first rescues, which helped the situation feel more natural and instilled confidence in him. As the helicopter came to a hover off the port side of the cruise ship, Scheren realized how calm the conditions felt, speaking to the seasoned pilot’s ability to stabilize the aircraft in 20 mph winds and five to 10 foot seas. As the flight mechanic connected the helicopter’s hook to Scheren’s harness and said “load check complete,” the only thing on his mind was making contact with the medical personnel and getting to the patient. Once Scheren made contact with the doctor, they led him inside the ship and into a small room where he first saw the survivor, who was conscious and in stable condition. First, the ship’s nurse was hoisted into the helicopter. The next order of business was to get the patient from the gurney to the litter. The survivor was rolled onto the deck of the ship, an area that provided a level and open platform for the gurney to be positioned beside the litter and for people to work. Scheren and some of the ship’s crew grabbed the sheet beneath the survivor and transferred the man onto the litter, where the spotlight of the helicopter greeted them. Scheren signaled to the helicopter that he was ready for the survivor pickup. As the hook was lowered from the helicopter, he battled the 90 mph winds from the rotor wash as he connected the line to the litter. Scheren gave a thumbs up to the awaiting flight mechanic hovering in the helicopter 30 feet above him. As the survivor rose above Scheren’s head, he took a moment to absorb what was going on around him. The hook was lowered one final time and Scheren once again clipped it into his harness before dangling beneath the aircraft for 10 seconds surrounded by complete darkness. Once in the helicopter, the door was closed, and Scheren hooked up equipment to the patient, giving him continuous readouts of the patient’s vitals, which would become crucial for the hospital staff. Scheren’s heart finally began to slow and his nerves began to calm as the survivor cracked a joke at him and the nurse. With 1.5 hours left to reach the air station, Scheren realized this was only the beginning of this rescue. After nine hours of combined flight time that day, the Jayhawk crew landed back at Air Station Elizabeth City. Plans had changed, and due to the duration of the flight, the crew met their maximum allowed flight time, requiring a crew change with the helicopter’s engines running. The back up crew, who had been recalled from their homes a few hours prior, jumped into the helicopter and flew toward Sentara Norfolk General Hospital, where they safely delivered the heart-attack victim and cruise ship’s nurse, concluding Scheren’s first rescue-a successful one at that. “You spend so long training, hearing instructors yell ‘so others may live,’ it’s nice to really feel that you’re living your creed,” said Scheren. “I’ve got a son and a wife at home that I love very much. Knowing that someone else is going to have a loved one that I was able to help is a very special thing."